Hello and thanks to Joy Randel for allowing me to be a guest blogger. 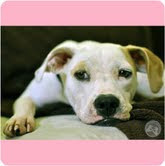 Like those of you who feel your dog is a member of the family and not just a pet, I am guilty of spoiling my only girl. I am also a strong believer in giving back. So, after reading about Rocket and seeing how Dazzle Dog Delight donates a percentage of their proceeds to the SPCA I felt like this was an opportunity I had to jump on. So, who am I anyways? I am a portrait photographer based in New England. I am looking forward to sharing some of my experiences and passion for living and working with dogs. I have always loved big dogs, the bigger the better, but recently a rescue pup from the south eastern part of the US has turned my world upside down. I named her Lakota. Getting up on the furniture was never allowed when I owned a large dog. To my astonishment it was the first rule to go after we brought Lakota home. She is so small that she just tucks herself into the cushions on the back of the couch. She will lie on her bed if told to, but I nearly never do. I had the previous misconception that small dogs are yippee and hyper. I have come to realize it really depends on the individual dog. Some that I meet do exemplify the description well, yet I am finding out now that they are the exception not the rule. I recently photographed a long haired Dauchshund named Dezzie who is a lot more talkative than my girl, but once he got to know me a little better he was great. Have you ever bathed a large dog by yourself? Thank goodness for experienced groomers. I myself have had the misfortune of finding out the hard way that some things are better left to professionals who have the proper equipment. It went a little like this: I was straddling the tub while holding the shower sprayer, the dog, and trying to lather shampoo on the dog instead of myself, not a good time for either of us. My little Lakota is a groomer’s dream. I can pick her up, I put her in the tub and she just waits. There is no fussing or squirming, she simply stands there until I am done. She has not been to a groomer yet, but I can foresee a special day in her future. She is a bit of a tomboy so she wears bandanas and sweatshirts when the occasion calls. I feel having a portrait made of your dog should be a wonderful experience. As a photographer there are a lot of variables to consider. One thing I have found to be true with smaller dogs is the ease in which it is to capture a full body shot. With larger dogs depending on how many there are to be photographed at once and the lens I am using I may be across the room or down the street in order to frame the shot well. As you can see one little girl from the south has changed my perspective tremendously. I still like big dogs, but I love and appreciate all that the little dog has to offer. We’d love to hear about your experiences too, so please feel free to comment on the blog! Thanks and hope to talk to you all very soon! We are fortunate to live right outside of San Francisco where it never gets too hot. The best thing to do in the summer is to keep your dog in the shade as much as possible. When you take your dog on walks or to the park, try do limit activity between noon and 2p.m. to prevent heat stroke. Dogs can not cool off easily like us humans because they can not sweat. They sweat a tiny bit through their paws but it is not enough to cool them off. The only way dogs can cool down is by panting but that does work well if you dog lives in a hot and/ or humid environment. There are some wonderful dog gifts that are available to help your dog cool down during the summer heat. You can buy your canine friend a dog pool which is made of tough PVC and it can be transported easily so you can take it on your summer vacation. 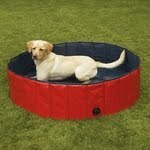 The dog pools are also easy to fill and empty and will keep your dog refreshed for hours. Our pool is relaxing and will provide your dog comfort. Cooling coats for dogs is another option if you live in a hot but dry climate. There are two types of cooling coats one that has fabric that absorbs water and as the water evaporates it slowly releases over a long period time. This evaporative cooling coat will keep your dog cool for hours. The other way to beat the heat is to get a dog cooling coat that uses an advanced technology that has specially designed inserts which release long-lasting, temperature-specific (58 degrees F, 14 degrees C), cooling relief designed to fit inside the dog coat. If you can not splurge on a cooling coat, then another summer gift item is a cooling bandana. These bandanas are made of a special material that absorbs water and slowly releases the moisture over time. If you put the bandanna in the refrigerator it extends the time your pooch can stay cool.